ECO-SOL MAX 3 is the new generation of Roland DG’s award-winning eco-solvent ink. The ink offers an overall better performance, with even faster drying times, bigger cartridges and a lower price per cc of ink. Of course, it also delivers the reliability, quality, consistency and durability that Roland ECO-SOL MAX is renowned for. ECO-SOL MAX 3 inks are available in CMYK, Lc, Lm and Lk, and can be combined with ECO-SOL MAX 2 white and metallic (for machines that use those ink colours). Packaged in clean-hands 500cc sized cartridges, ECO-SOL MAX 3 is designed to meet the needs of those customers running busy print shops. 220cc cartridges are also available for customers with low usage requirements*. 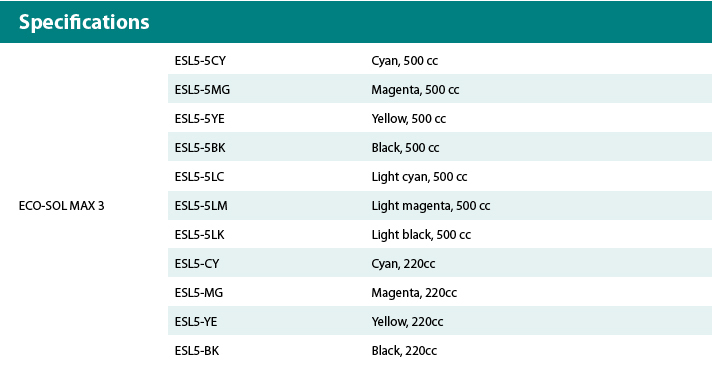 *500 cc cartridges are available in CMYK, Lc, Lm and Lk. 220cc cartridges are available in CMYK. Customers should now order ECO-SOL MAX 3 ink with the purchase of every new eco-solvent Roland DG printer. The ink is also available to our existing loyal customer base as a performance upgrade. * This remarkable eco-solvent ink technology is designed to enhance the performance of Roland’s VersaSTUDIO, VersaCAMM, VersaEXPRESS and SOLJET ranges of inkjet printers and printer/cutters. ECO-SOL MAX 3 has an extremely wide colour gamut that delivers rich, vibrant and solid colours, which look stunning up close or when viewed from a distance. Light black ink improves the reproduction of gray scale gradations, and the stability of skin tones or natural tints. Printing even the finest details beautifully, ECO-SOL MAX 3 will delight the most discerning of customers. ECO-SOL MAX 3 offers the peace of mind of GREENGUARD Gold Certification, providing assurance that the ink meets some of the world’s most rigorous and comprehensive standards for low emissions of volatile organic compounds (VOCs) into indoor air. Safe-to-use without special ventilation or environmental equipment, the ink’s GREENGUARD Gold Certification also includes safety factors that ensure a product is acceptable for use in environments like schools and hospitals. Ideal for use externally or indoors, this tough, scratch resistant ink can withstand outdoor environments for up to 3 years without lamination*. ECO-SOL MAX 3 is also ideal for the production of graphics that require finishing techniques, offering high scratch resistance when undertaking common finishing processes, including welding, sewing and attaching grommets. * The life span for outdoor use is based on accelerated weather testing. Results may vary depending on the location and the application. Lamination is necessary for some applications and weather conditions. With ECO-SOL MAX 3 you can print onto an extremely wide range of coated and uncoated materials, enabling you to achieve a versatile range of output. Whether you print onto paper, vinyl, banner, canvas, coated textiles, high gloss, heat transfer or much more beyond, ECO-SOL MAX 3 delivers a quality result. ECO-SOL MAX 3 ink dries fast. Bonding powerfully to a whole range of substrates, your prints can be handled as they roll off your printer. When used in tandem with a take-up unit, ECO-SOL MAX 3 enables you to achieve long, unattended print runs, even in high-speed mode.